In Mar. 2017, we ushered in a group of customers from Thailand. 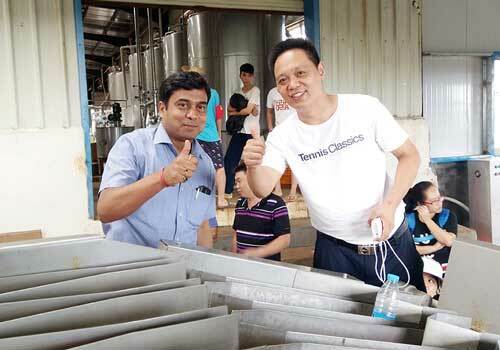 They visited our workshop, satisfied with our products and technology. Then, they asked about the parameters and details of our citrus processing line. After listening to the introduction and watching the processing effect of our equipments, they decided to order a complete citrus juice processing line from us. Besides, they show great interest to Chinese culture, and want to extend our cooperation in the future. TICO is an exporter and service provider which has more than 20 years experience on foreign trade. We specialize in drinks & beverages stand-alone and complete sets of equipment. Companies adhere to take the market as the guidance and concentrate on research and development for all sorts of beverage machineries. With more than 300 professional staff in TICO, they work in different operating posts, provide quality services including a variety of beverage machineries, technical skills, plane designs, installation and commissioning as well as staff-training for more than 150 countries from Europe, Middle East, Africa, South America, Central Asia and southeast Asia etc. As a leading fruit processing machine manufacturer in China, we will renew our commitment to providing superior products and comprehensive service. Welcome customers from across the world to visit and consult.